Historically, fruit trees, shrubs, and berries were grown at home out of necessity. Colonialists were entirely dependent on what they could produce themselves, and in time, a fruitful garden became a common symbol of independence from foreign imports—highlighting a new American pride in agriculture. The farm-to-table movement of today epitomizes the fruit-growing traditions of the past by “growing as close to the plate as possible.” Sweet, juicy fruit can be easily grown in gardens of all sizes: on small urban lots, in containers on terraces, or in large suburban gardens. Harvesting homegrown fruit continues to be a gardener’s most satisfying pleasure, and with a bit of advance planning, choosing suitable varieties to plant this spring is possible. 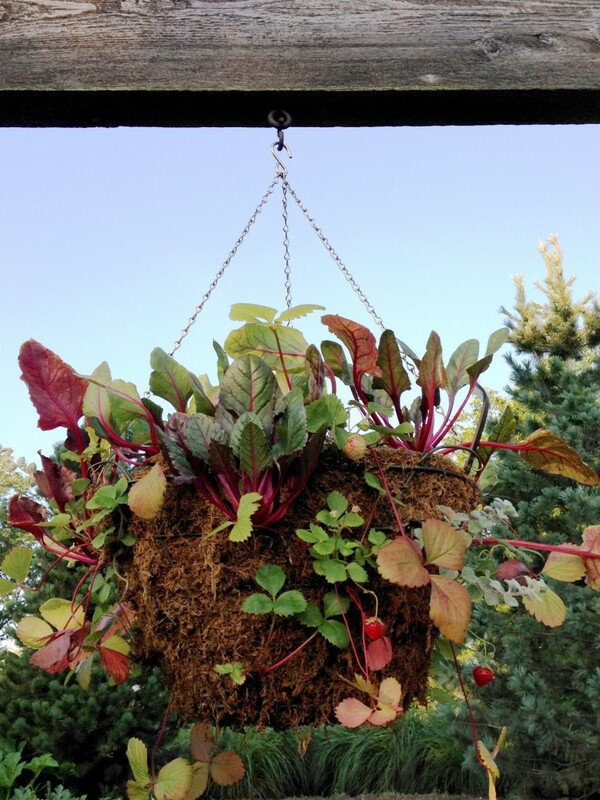 Here are a few ideas to get you started creating, and/or caring for, your edible landscape. Day neutral strawberries are grown in our vertical wall and hanging baskets in the Regenstein Fruit & Vegetable Garden. No grocery store strawberry ever tastes as good as one grown in your own yard. An easy starter crop, strawberries are self-fertile, so you can start small if you like—plant just one variety or only one plant—and still reap a reward. Choose strawberry varieties carefully, however—they vary greatly in flavor, disease-resistance, tolerance of different climates, and harvest time. Good choices for Illinois gardens are larger June-bearing strawberries such as ‘Earliglow’ and ‘Allstar’. Day-neutral or everbearing strawberries were developed to produce flowers and fruit continuously throughout summer and fall, ignoring the seasonal effects of day length on fruit production. Of the many day-neutral and everbearing varieties to choose from, ‘Tristar’ is a reliable berry for our zone. At the Garden, we grow everbearing strawberries ‘Mara de Bois’ and ‘Seascape’ in hanging baskets and vertical plantings, because they are among the first to fruit in the spring, but also produce a June crop followed by a final fall crop. Planting several varieties together in your garden extends your harvest time, ensuring there are plenty of strawberries for eating out of hand and enough fresh berries left over to make strawberry jam. Start with quality, virus-free, and disease-resistant plants. Mail order nurseries and garden centers have bundles of bare-root plants available. Lesser quality plants are prone to fruit rot, mold, and fungal diseases like Verticillium wilt. Strawberry flowers are susceptible to frost. 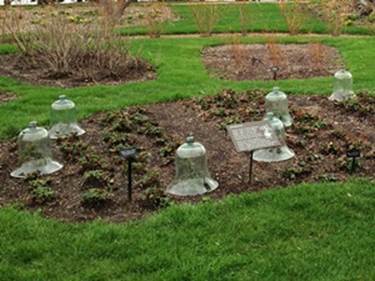 Here, a transparent plant cover called a cloche (from the French word for bell) is used to protect plants if frost is expected. Select a planting location in full sun; avoid low-lying spots or crop beds that have grown tomatoes, potatoes, or cane fruit in prior years. These crops can harbor soil pathogens like Verticillium and Phytophthora which can affect new plantings. While strawberries prefer to grow in soil with a bit of acidity, a pH of 6.2 is ideal; the varieties mentioned above perform well in Chicago. Aim for early spring planting, as soon as the soil can be worked, and its temperature is above 40 degrees Fahrenheit. Mid-April to mid-May is ideal. Space plants 12 inches apart, leaving 3 feet between rows. Fifty plants produce enough fresh home-grown fruit for four people all summer long. Plant with midpoint of crown at soil level. Roots should be planted straight down. Strawberries are shallow-rooted, and mother plants spread by runners—which can be removed if desired, to develop stronger plants and to promote bigger fruit. Water your plants well, particularly when they are fruiting. Mulching with straw helps keep fruit clean and dry, and up off the soil. Red, yellow, black, or purple raspberries are easy to grow in hedgerows as natural barriers along lot lines or on post-and-wire trellises. Cane fruit is best managed with proper spring pruning, which prevents a tangled mess and makes your late-summer harvest far easier. Regular pruning keeps brambles in line while allowing air flow through the plant—lessening the risk of fungal diseases like Botrytis and rust, and increasing both yield and berry quality. Both types of raspberries—summer-bearing and everbearing (or fall raspberry)—benefit from a good March pruning. A bountiful berry harvest on its way to our Farmers’ Market? A bountiful home harvest is also possible with vigilant pruning. Summer-bearing raspberries produce a single crop in the summer on canes which have overwintered. It is important to confine them to a 1- to 2-foot-wide hedgerow to encourage air flow and sunlight. Begin your pruning by removing dead, diseased, or damaged canes first. Then, head back (prune) the spindly top 6 inches of cane tips. Removing the thinnest wood which produces the smallest berries forces the growth into the more vigorous lower part of the plant. Finally, remove less vigorous canes—in an established plant, those canes with less than a pencil’s diameter thickness—leaving 6 inches between canes (enough room to easily pass your hand between canes). To produce one heavy fall crop, cut all autumn raspberry canes back to ground level in the spring. Canes should be cut as close to the ground as possible to encourage new buds to break just below the surface. All new canes will grow from this radical pruning and produce a single crop of berries. A second method of pruning produces a small crop on the previous year’s growth and later, a second crop on the current season’s canes. When a double crop is desired, remove dead, diseased, or damaged canes in March, leaving the vigorous canes to fruit. Tip-prune those back by one-third of the total length of the cane, or to trellis height. The new shoots or primacies will produce the second larger crop. After the second fruiting, the canes will die and should be removed. Pruning for blackberries is similar to raspberries. They are also pruned in March by heading back the “leaders”—the main canes—by one-third (or about 36 inches). This tip-pruning helps to stimulate the growth of lateral branches, which is where blackberry sets fruit. The lateral branches should be pruned back to 12 inches, or where the branches’ thickness is about the diameter of a pencil. 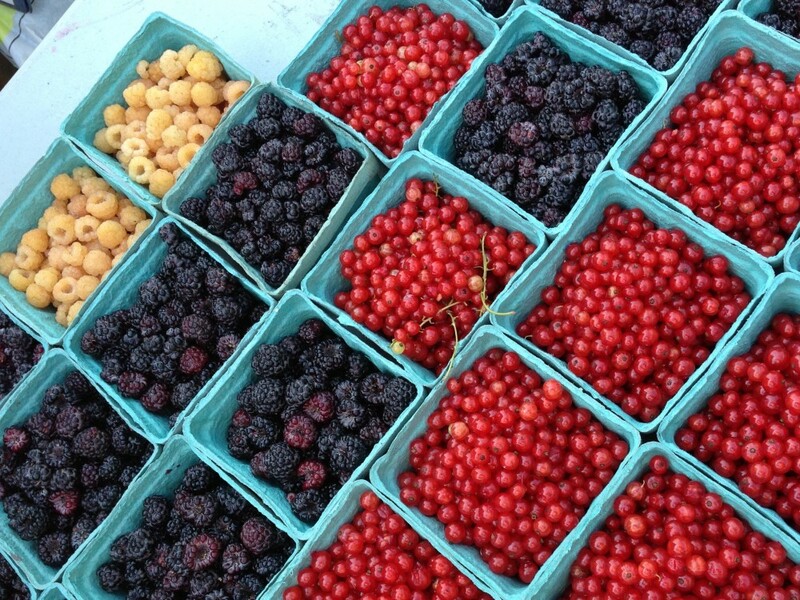 Want to learn more about cultivating berries? Join us for Growing Fruit Trees and Berries, May 29 to July 10, or check out other fruit cultivation classes at the Garden this spring. Thank you for the reminders. I can’t wait to get into my garden. I love my June-bearing strawberries, but would love some that go all summer, just not sure where to put them. Which ever-bearing would would well vertical in this area? Thanks for your question Juli. You’re right…those June bearers are delicious! Everbearing (day neutral) varieties like Mara des Bois (pictured in the hanging baskets) and Seascape perform well in vertical plantings. You will see them growing this summer in our living wall in the Fruit and Vegetable Garden.